Known as an unpredictable race event based on the complex, taxing Circuit Gilles Villeneuve, the 2012 Canadian Grand Prix fast stretches and slow corners routinely provokes some of the most uneasy driving on the Formula 1 tour. Set for 70 laps, the 24-car field of the Canadian Grand Prix line-up under a perfectly sunny, warm June day under the lead of Red Bull-Renault driven by Sebastian Vettel. In a rather uncharacteristic fashion, the 2012 Canadian race for the Formula 1 tour started cleanly with Vettel pulling away with McLaren-Mercedes competitor Lewis Hamilton in hot pursuit. Without any early race mishaps among racers, the Circuit Gilles Villeneuve would wind up as a quick 70-lap sprint on the gruelling grand prix track. The only race cars failing to finish the 2012 Canadian Grand Prix were eliminated due to mechanical problems with brake-related damage leading to three of the four retirements. Michael Schumacher’s race was defeated by a hydraulic failure on his Mercedes GP machine on lap 43 that left his DRS system locked open. The Grand Prix of Canada is the 5th retirement for Schumacher within the seven events held so far this year. The deciding factor for the 2012 race in Montreal would be pit stops. The McLaren team made use of a two-stop strategy on Hamilton’s race car that provided the Brit the new set of soft compound Pirelli tires needed to catch Fernando Alonso’s Ferrari. With eight laps remaining, the McLaren-Mercedes of Hamilton caught Alonso’s Ferrari, passing the Spaniard for the lead of the Canadian Grand Prix late. Pulling off a 2.5-second gap on second-place, Lewis Hamilton crossed the start/finish line to win his third Formula 1 race at the Circuit Gilles Villeneuve. Becoming the 7th driver in 7 races so far during this wide-open Formula 1 season of 2012, Lewis Hamilton wins the second race for the McLaren team following teammate’s Jenson Button’s victory in the debut round in Australia. 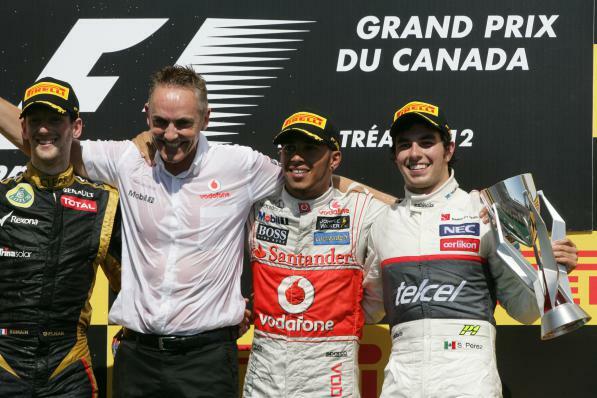 Joining Lewis Hamilton in the Canadian Grand Prix podium the 70-lap event was two drivers aided by one-stop strategies. 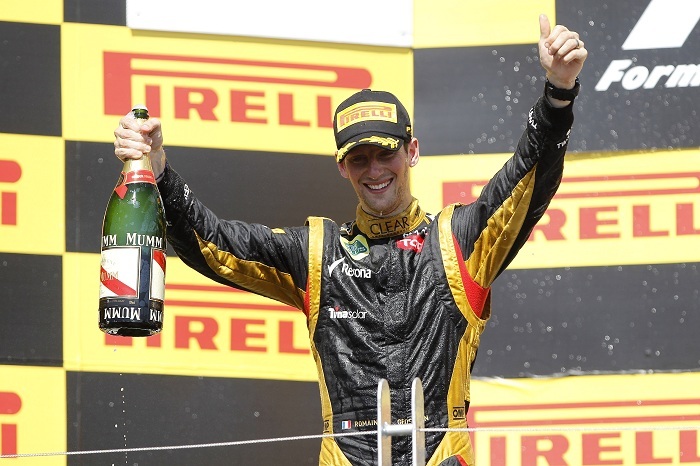 Starting 7th for Lotus-Renault, first Formula 1 visit to the Circuit Gilles Villeneuve was an impressive second podium effort in the 2012 season. Starting on supersoft Pirelli tires, Grosjean’s crew fitted the harder compound slick rubber on the team’s race car on lap 21. Romain Grosjean achieved his career-best Formula 1 result at the 2012 Canadian Grand Prix. Deteriorating in pace during the late stage of the Canadian Grand Prix, the Ferrari team’s best hope of honouring the 30th anniversary of former team driver Gilles Villeneuve’s passing dropped down the running order like a rock. Leading the race with 8 laps to go, Alonso’s Pirelli tires were well worn on the Canadian racetrack. At lap 70, Fernando Alonso fell to 5th place just 0.4 seconds ahead of Nico Rosberg‘s Mercedes GP car. 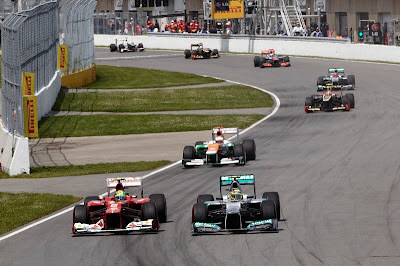 Mark Webber, Kimi Raikkonen, Kamui Kobayashi and Felipe Massa rounded out the top-10 for the 2012 Canadian Grand Prix. The next race for the 2012 Formula 1 tour will be a trip to Spain to race the Valencia track for the European Grand Prix on June 24th.